Chat is easy when it takes place in a little square box on your laptop or mobile screen. But the more you do it, the more you may find you struggle when it comes to passing the time of day face-to-face with real live humans. It’s worth maintaining your meatspace social skills for a number of reasons: to network, to maintain and build relationships with friends and colleagues, and because there can actually be a great deal of pleasure in sharing a moment of warmth with another member of the species – even if that moment is encapsulated in the most frivolous of remarks or shared observations. We’re social creatures, and screen time doesn’t meet all of our needs even if it sometimes feels far preferable to getting trapped in verbal conversation with a shop clerk, client, or stranger. Chat is how we learn about each other and about life, not just through the words or ‘content’ of a conversation but through the cues, gestures, errors, and pheromones that face-to-fact interaction involves. Small talk actually makes you smarter and more capable of problem-solving. It creates bonds. And it makes you feel more complete, even if you feel like you’re falling apart while doing it. But how to go about mastering it? The words that flow out of your fingertips when sat on internet chat can suddenly dry up when faced with a real life Earthling within actual poking distance. The thought of finding yourself adrift with expectant eyes on you and no answer forthcoming can strike terror into many a digital marketing professional’s heart and prevent them from ever leaving the virtual world. But the advantage of small talk is that words actually play a very small role in proceedings. Rather, the experience is built up of a number of other elements, many of them physical. Eye contact goes a very long way. Not only does it indicate that you’re engaged in the conversation – even if you’re struggling for words – but it forms a connection and builds trust between conversationalists. You recognize each other’s fundamental humanity and cut each other a bit more slack when it comes to delivering the ‘perfect answer.’ You also recalibrate the conversation so the rhythm isn’t predicated on the back-and-forth of words. Eye contact can fill a silence and make it okay. But eye contact can feel just as nerve-wracking as talking for some people. It’s fine once you get started, but something inside holds you back, tells you that you’re making yourself vulnerable by opening those windows to your soul. In this case, it can be effective to follow a more mechanical route. Instead of telling yourself to make eye contact, draw an imaginary triangle on the other person’s face, with one point at each eye and the other at their mouth. Switch looking between points every five-ten seconds. Soon it will become natural. Your eyes and theirs will hopefully ‘hook in’ and you will become more comfortable with each other. And even if you continue to sweat until the chat is over, you’ll feel much better about it after. Some people hate small talk because it has a rep for being boring. Others hate it because they don’t know what to say. Of course, some chats will always be boring. But reframing the experience as a chance to learn more about human nature, the minutiae of how we each get by on this little planet, and to find value what you’re actually hearing rather than what you think you’re missing, can make it a more rewarding process. You can keep clear of divisive topics by remember the F.O.R.D. acronym: Family, Occupation, Recreation, Dreams. (Notice: no politics or religion). Ask open questions (those that require more than a yes-or-no answer) on these topics and listen carefully to the answers rather than preparing your next question in your head. Engage in what the other person is saying rather than your fear of what you will say, and the next steps of the conversation should start to come naturally. Fear of small talk tends to come down to two things: fear of awkward silences, and fear of getting into a conversation you can’t get out of. In the first place, remember that nobody ever died of an awkward silence. (If you know of somebody who did, please let us know in the comments). And in the second place, remember the phrase “I need.” You need to get a glass of water, you need to meet somebody with whom you’ve made arrangements. Be polite, but remember the person you’re chatting with may also be relieved to draw the small talk to a close. 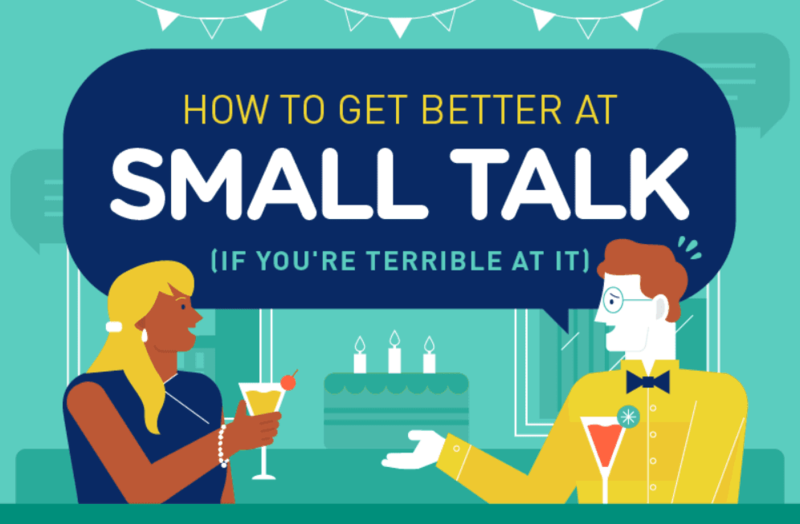 This new visual guide on making small talk will help you to make the next chat a better one.